This is part 2 of my short, 4-part series on Michigan brews. You can take a look at the first part, in which I discussed Atwater's Purple Gang Pilsner, to get a better idea of what this series is. To briefly describe it, I built a four-pack and threw in some beers native to MI that I'd never before had so I could share my first impressions of them with you, my beloved readers. The beer I'm discussing today is Blackrocks Brewery's winter seasonal: North Third Stout. I know, I know. "It's spring now!" you are probably exclaiming as you read this. "Why is he talking about a beer specifically crafted to be enjoyed a season ago?" Well, in my defense, although I awoke to a beautifully sunny Cincinnati day, the world outside of my window has since turned cold and gray (I even spotted the sky spitting out a few flurries). That's wintery enough for me to get into this beer. The brewery is located in the City of Marquette, in the Upper Peninsula just south of Lake Superior. Its name is derived from the Black Rocks that can be found along the lake. At least, that's what the can containing the stout leads me to believe. Don't take my word for it; I've never been there. 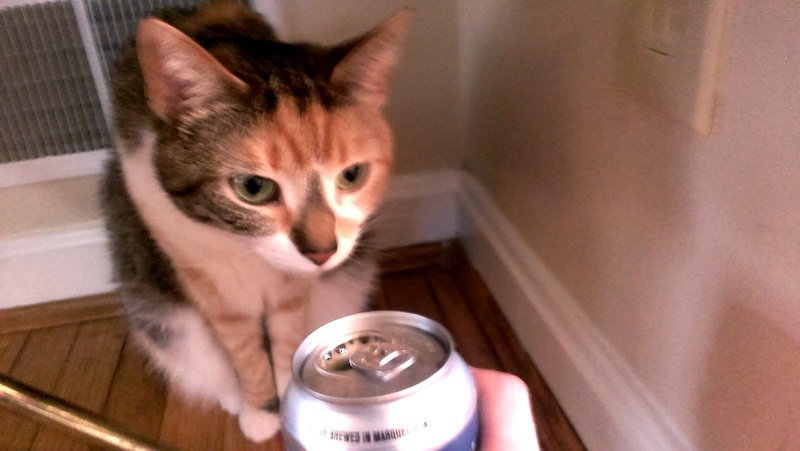 I'd listen to the can, though. It seems to know what it's about. It says the beer is "Brewed for winter; cold winds, warm fires, and snow (lots of snow)." I know how much snow southern Michigan gets (having spent many a holiday season visiting extended family native to the area) so I trust that the UP gets plenty of snow. The amount of snow they must get brings me directly to the brew. I'm often disappointed in winter seasonals because many of them don't seem to get it. When It's cold and snowy outside, so cold and snowy that I can't drive, I like a beer that warms me from the inside out. This isn't necessarily achieved through the burn of the alcohol (like what you find after a shot of whiskey). Rather, and especially in winter brews, I like to find it in the taste of the beer. The ever-knowledgeable can says the stout is "Dark, roasty, smooth, and delicious." Blackrocks' online description of the beer adds "chocolatey" to the list. All of this is true. The, what I assume are, roasted malts used to brew the stout adds a coffee flavor that I love. North Third Stout has a genuinely warm taste that is present in all of my favorite winter seasonals (Christmas brews included). Apart from all that warmness, though, there's a tiny hint of bitterness in the brew which helps it find balance. The aroma is exactly what I expected. The warmth of the roasted malts carries through here similarly to way it does in Third North's taste. Imagine your preferred stout (or maybe even porter, depending on its roastiness). Can you smell it in your mind? Good. Now you know what to expect from this. I don't think Purrl knew, though. She gave it four quick sniffs and slinked away. I don't know why she didn't like it. Maybe she smells the note of bitterness I taste? I wasn't quick enough for it to not be blurry. Oops. The beer's smooth (as is promised on the can) but chewy like a stout should be. If one was dumb enough to attempt it, all twelve ounces of it could be polished off in a few big swigs--that's how smooth it is. When I dream, which isn't often, it's usually like a TV show that I tune into a few minutes after it started. I miss the exposition, see the rising action, the climax, and typically wake up during the falling action. Sometimes, though, I dream of a scene with no plot: a place where I just exist for a moment in time. Once I was at the foot of a hill in the woods. It was night and I was shin-deep in fresh powder. Snow was falling. I was the only person around so the area was quiet and peaceful. That's this stout to me. A small portion of restful, welcoming winter. 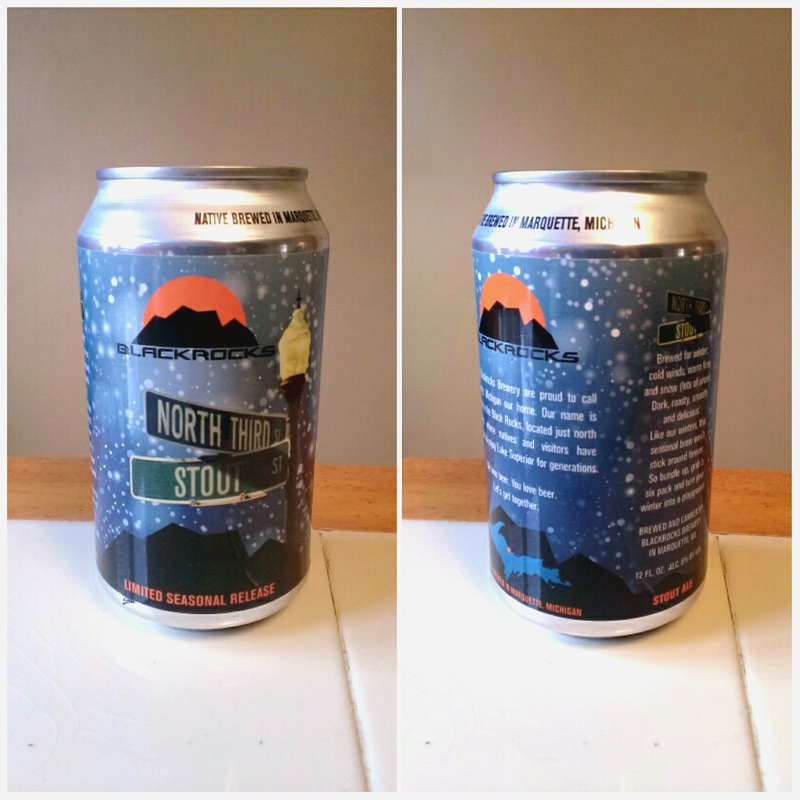 Blackrocks Brewery's North Third Stout is 6% ABV, which is enough to provide you with a beer jacket for winter's coldest days. I like it a lot. Heck, I like it enough to give it a solid 9.0/10. This is the first beer I've had from Blackrocks, but now that I know the quality of their products I'm looking forward to grabbing another one of their brews the next time I'm in Michigan. Although, I really hope they start exporting to Ohio soon so I won't have to wait too long.